"You’ll enjoy reading her experiences with kimono wrapping and the traditional tea ceremony. In every section of the book, Ruggieri is honest, unpretentious and tells us her thoughts and feelings on living alone in a foreign culture." Click here to read the ful review of The Character For Woman by Tricia Drake at Writers' Ezine! "I think you have to be born Japanese to write a true haibun, but I don't see any problem with stealing ideas from other cultures and bending them to my American way of thinking. I kept a journal during a recent visit to Japan and the entries were a way of thinking for me. I wanted to describe what I saw and experienced so that I could understand and remember. The haiku seemed to stick themselves in as capsulizations. The haibun is an interesting form and as one who has long been interested in poetry and journal keeping, it seemed a natural extension as well as a way to blend east and west." Helen Ruggieri spent a semester as a visiting professor at Yokohama College of Commerce. She lives in Olean, NY and teaches at the University of Pittsburgh, Bradford, PA. She received a Sasakawa fellowship from the Nippon Foundation for the study of Japanese culture. Her poetry book, Glimmer Girls, is available from Mayapple Press. The Character For Woman is a 60 page paperback, hand-sewn, with flat spine. This is Helen's first FootHills Publishing release. To order by mail send $10.00 per book plus $1.25 shipping and handling per address sent to. In front of me, tiny waves keep going peacefully to the beach. the sun had gone out of, a rose becoming coral. But where are so many small waves going? But how can waves run out of water? something moves, a shadow wave. 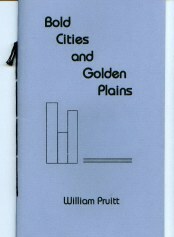 Bold Cities and Golden Plains is a 48 page, hand-stitched chapbook. This is William's first FootHills Publishing release. To order by mail send $7.00 per book plus $1.25 shipping and handling per address sent to. their coughs and hisses, scrapes and dents. He sweeps my hair into the morning's pile. pounding ice from the bent downspout. When the doorbell rings, it's the Witnesses. When the mail comes, it's for RESIDENT. Philip Memmer's poems have appeared widely in journals such as Poetry, Poetry Northwest, and Southern Poetry Review. 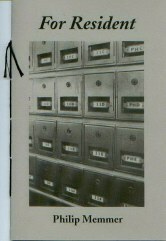 His first chapbook, The Apartment, was published in 2001 by piccadilly press. He lives in central New York state, where he edits the poetry journal Two Rivers Review and directs the Downtown Writer's Center, a member of the YMCA National Writer's Voice. For Resident is a 32 page, hand-stitched chapbook.